Hiking is a great way to stay (or get!) fit while enjoying the great outdoors. It's very important to dress properly when you take to the trails. Getting geared up to go out for a hike requires considering the weather and terrain you're likely to face along the way. Consider these suggestions for essential hiking apparel, as well as optional items that can help you dress properly to make the most of your time in the great outdoors. When selecting pants to wear on the trail, you may want to opt for a traditional pair of hiking pants. Look for sturdy cargo styles designed for outdoor wear. The best choices are made from breathable fabric and have mesh-lined pockets that zip closed to keep your loose items safe. For warm weather hiking, look for pants that have strategically placed vents to help keep you cool while still protecting your legs. For winter hiking, though, avoid styles with vents. If you want to keep your legs covered but prefer more form-fitting pants that move with you, opt for a pair of quality leggings or tights that will hold up well in the outdoors. Spandex yoga or running tights are great options for day hikes, or even overnight backpacking trips. If you're going on a multi-day backcountry outing, though, you may want to go for something heavier-duty, like tights designed for triathlons. For cold weather hikes, you may also want to wear this kind of bottom as a base layer under traditional hiking pants. If you don't want your legs to be fully covered for warm weather hiking, cargo shorts can be a good option, as long as they are loose-fitting and made from a breathable fabric. Look for deep pockets that zip (ideally), though Velcro closures can also be useful. If you like the idea of cargo shorts but aren't willing to commit to having your legs exposed throughout your hike, consider opting for a pair of convertible hiking pants with leg bottoms that can easily be zipped on or off. The pair shown here is nylon with an elastic waistband, but they come in a variety of fabrics and styles. If you're cool (no pun intended) with shorts but aren't into cargo style bottoms, consider opting for a pair of running shorts. They're designed to be worn outside during heavy activity, so they're a great option for hiking. Look for lightweight, breathable fabric and an easy fit so you have freedom of movement and stay comfortable throughout your hike. Biking shorts are another great option for warm-weather hiking. They should be form-fitting without being so tight that they cut into your legs. Be sure to try them on before committing. Walk around quite a bit in the fitting room (or at home if you shopped online) to make sure the legs don't ride up. That would make for a miserable hike! When you're hiking in warm weather, a tank top or short-sleeved shirt designed for workouts or extended outdoor wear is a great option. This type of top should be somewhat fitted. Don't opt for a size that is too tight or too loose - it may seem like a blousy, loose top would be ideal for hiking, but this is not the case. Even if you're not hiking in warm weather, this kind of top can be a good base layer. Layering is a great strategy when selecting tops for hiking adventures. Even when it's chilly outside, you might find yourself wanting to shed layers as you start to warm up as a result of exertion. Consider wearing a base layer with an additional pullover shirt, as well as a button-up shirt and or a sweatshirt. This will give you maximum flexibility when it comes to adding and/or removing clothing items based on your comfort level. 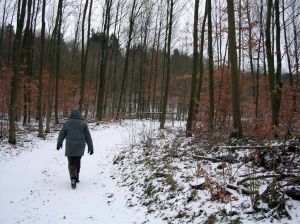 Jackets designed for outdoor use are a must have for cold weather hiking. Look for non-bulky, easily packable jackets designed for outdoor use and rated for use in the type of climate you'll be in. Styles with zip-on/zip-off hoods are great for hiking. If you are a four-season hiker, chances are that you'll need a selection of jackets to be sure that all your hiking wardrobe warmth needs are met. Consider GORE-TEX or comparable waterproof outerwear that will keep you dry and warm. If you'll be hiking after dark, consider getting a headlamp as well. You'll also need a lightweight rain jacket or windbreaker to keep close at hand in case you get caught in showers (or a downpour!) while on the trail. Choose one sized to fit over whatever else you may be wearing - even if you're bundled up in all your other layers. That way, you can get by with just having one rain jacket. Look for one that can be rolled up and stuffed into a tiny corner of your gear bag so you can keep it with you at all times. Last on the list - but certainly not least - is the all-important footwear aspect of hiking apparel. It's so important to have quality, properly fitting hiking boots, as well as moisture wicking socks. There are many styles of hiking boots, from fairly low top options just slightly taller than walking shoes to ones that have an 8" shank. Try on several kinds to see what you prefer, keeping in mind the level of ankle support that you need. Also consider the kind of terrain you'll be hiking and whether you need boots that are waterproof. Wear the style of socks you actually plan to hike in when selecting your footwear to ensure that you're getting the best possible fit. It's also important to consider sun protection when considering what to wear when you go hiking. A hat designed for outdoor use can be a great way to protect your face, ears, and neck from getting burned. The hat shown here is the Quick Shade Floppy style from Seirus. It's made of quick drying fabric with a UPF factor of 50. A truly unique feature is its built-in shade that provides an additional layer of sun protection beyond what you'd get with a hat alone. Of course, there are plenty of additional accessories to consider. A headlamp is a great item to have if you'll be hiking at dusk or after dark. If you plan to hike during the winter, you may want to round out your hiking wardrobe with a vest, gloves, and balaclava (to keep your face warm). Start with the basics and gradually add items as you get a sense of how often you will hike and in what conditions. Chances are that you'll continue to add new items to your collection of hiking gear as time goes by!